History: Diana was kept with another male adult sun bear called "Ronnie". Both of them were rescued from the View Top Resort, Tawau, South-East coast of Sabah in July of 2013. 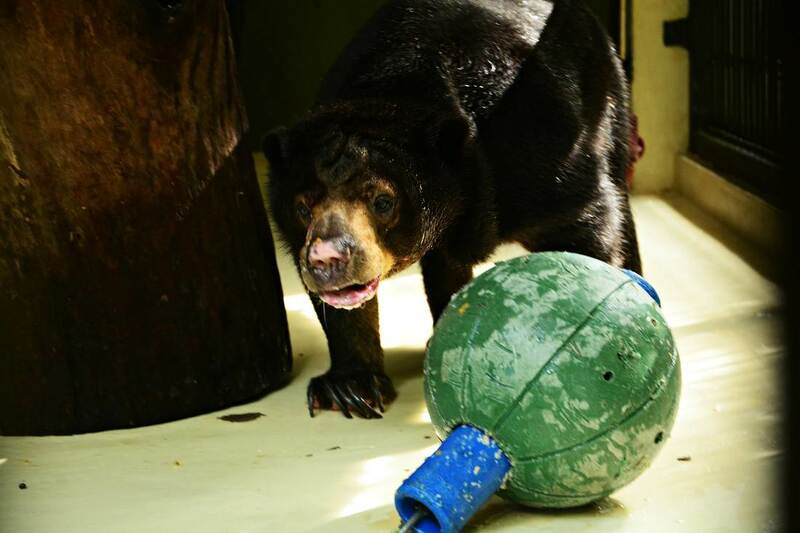 Their owners said that they had been keeping the two bears together in a small concrete floor cage, and displaying them to the public at View Top Resort, Tawau. They were fed with rice and fruits. Personality: Upon her arrival at the BSBCC, Diana was in a bad condition. She had an old injury hole on her right snout, bald patches on the back of her head and unhealthy gums due to fighting with Ronnie in her previous surrounding. Diana is a sensitive bear and made warning sounds to show her displeasure at the presence of humans on her first day at BSBCC. She has been moved from the bear house to quarantine for special care due to her health condition. She is chilled and enjoyable together with two young female bears, Sika and Kina in quarantine. Diana does not really like to climb. She spends more time on the ground. A simple enrichment can really make her day. Identifying mark or trait: Old injury hole on her right snout.